Throughout art history Dutch and Flemish art has been very distinctive, both in its methods and subject matter. Northern Europe was the first to use oil paints, moving away from water based tempera during the early 15th century. Oil paints allowed an increased degree of detail within the painting and this intricacy and attention to detail continued to dominate Flemish and Dutch art for the next three hundred years. In the 1500's the Low Countries split in two. Flanders continued to be Catholic and the remainder, the Dutch Republic, became Protestant. This introduction to Protestantism also led to the popularity of non-religious subject matter, such as still lifes, landscape and genre painting, not only in the Protestant Dutch Republic but also Catholic Flanders. 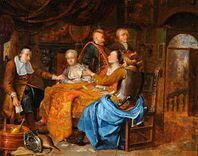 This painting by the Flemish artist Franz Xavier Hendrick Verbeeck is a genre painting, which is a category of painting depicting scenes of daily life. Genre painting often conveyed morals and proverbs using various symbols within the painting. Some of these symbols are obvious such as gambling, seen as a vice, ultimately leading to the individual's downfall. But the meanings of some other symbols have been lost over time. 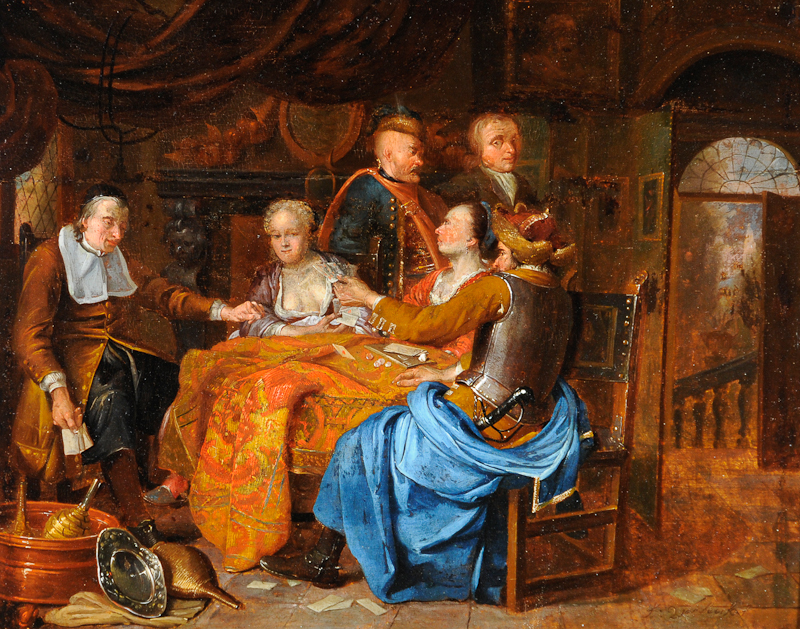 In this painting we see a soldier playing cards, leaving his sword vulnerable and unguarded. There seems to some plot afoot, possibly referring to an historic event or proverb well known at the time. There is a feeling of chaos, brought about by the discarded empty bottles, possibly Port Wine bottles. Playing cards are strewn on the floor, perhaps thrown to the ground after a losing 'hand'.